Manage and record from up to 32 cameras with the ENR-421 Standalone NVR from ACTi at resolutions of up to 12MP at 480 fps. 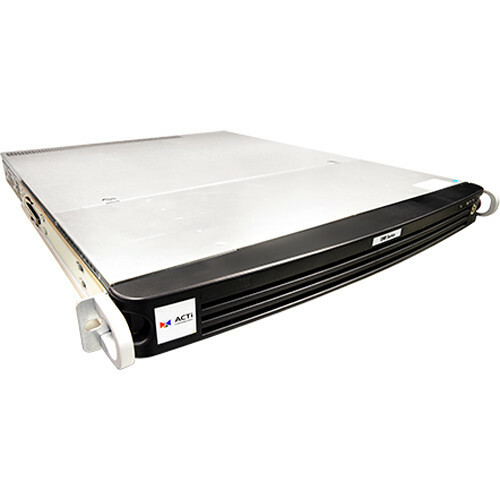 Equipped with four 3.5" Serial ATA ports, each of which can accommodate an HDD up to 12TB, this NVR supports up to 48TB of storage (8TB preinstalled). External storage options include PCs via internet connection, network servers, and USB storage devices. It supports H.265, H.264, and MJPEG compressions which help optimize network bandwidth use while ensuring high-quality recording and playback. The NVR enables simultaneous recording and playback of up to 16 channels locally and 32 channels remotely. It can support up to one local, two remote, and one mobile clients simultaneously. A maximum combined throughput of 300 Mb/s is supported and this NVR features a USB 3.0 port, two USB 2.0 ports, a WAN port, a LAN port with RJ45 connector, two digital inputs, two digital outputs, and an HDMI port. An audio input and output allow for two-way audio and this NVR supports video export in raw or AVI format. Recording Frame Rate 480 fps total max. Power Source and Consumption 100-240 VAC, 250 W max.